Smartphones shipments in China grew a modest 3% annually during Q2 2017 (Apr-Jun), registering second consecutive quarter of annual growth this year. The Chinese market showed a positive uptick in demand as well as supply during the June ending quarter. June seasonally is a strong month for China as it is usually buoyed by portfolio upgrades from major brands such as Oppo, vivo and Xiaomi. The top four Chinese brands now capture close to 69% of the market as these brands have raced ahead of international and other local brands with expansive distribution reach and exciting portfolio. Huawei and vivo were the fastest growing brands followed by OPPO and Xiaomi, together cementing the top four spots and extending their lead over Apple and Samsung by a widening margin. Apple’s performance continue to be seasonal, while Samsung is losing out to the Oppo-Vivo onslaught in offline. Xiaomi made a surprise comeback after being on decline for a few quarters against Huawei Honor. As predicted, last quarter, the Chinese smartphone market saw a healthy sell-out through April, May of the second quarter with some level of inventory correction allowing the Chinese brands to ship more smartphones in June with a revamped portfolio. Huawei continued to capture the top spot this quarter ahead of rivals OPPO and vivo, shipping higher volumes into the channels. Huawei’s nova, enjoy series along with flagship P10 were in strong demand during the quarter. OPPO and vivo were able to also grow significantly over last year with strong performance in mid-tier with A and Y series respectively as well as with F/R and V/X series in high-tier respectively. Each of the series are well positioned in the fast-growing $100-$199 (600-1300 rmb) and affordable premium $300-$399 (2000-2700 rmb) segments catering demand from tier-1 cities to tier-4 towns. Meanwhile, Xiaomi saw a positive uptick growing 20% YoY and almost doubling the volumes sequentially after a dip in Q1 2017 when the vendor’s volumes reached almost 2013 levels. The key reason behind the comeback can be attributed to strong demand for its latest flagship Mi 6 and low-tier models such as Redmi 4X as well as focus on diversifying distribution channels. The days of easy growth are over for Huawei, OPPO, vivo and Xiaomi in China. The competitive landscape is converging as all the top four Chinese brands have reached a steady and dominant position in a very slow growing market. The race for the top two spots is always up for grabs as one misstep can push a brand easily two spots behind. 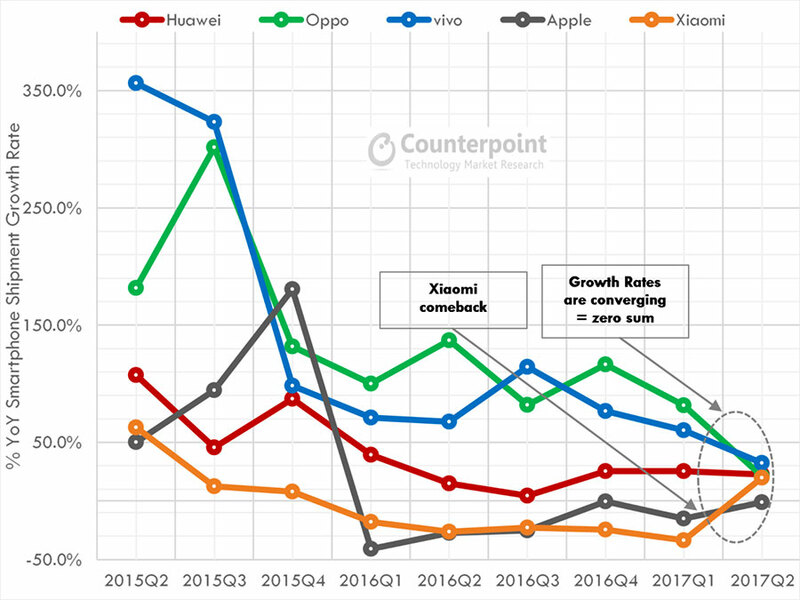 The comeback of Xiaomi from the declining spiral has made the market further competitive and almost a zero-sum game. The dip in performance by either of brand could affect their global performance. As a result, China dependent brands such as OPPO, vivo and Xiaomi will be aggressive in expanding their reach beyond China during the second half of this year. India, South Asia and Africa will be the key focus geographies to drive additional scale and market share to make up any dip in domestic market.